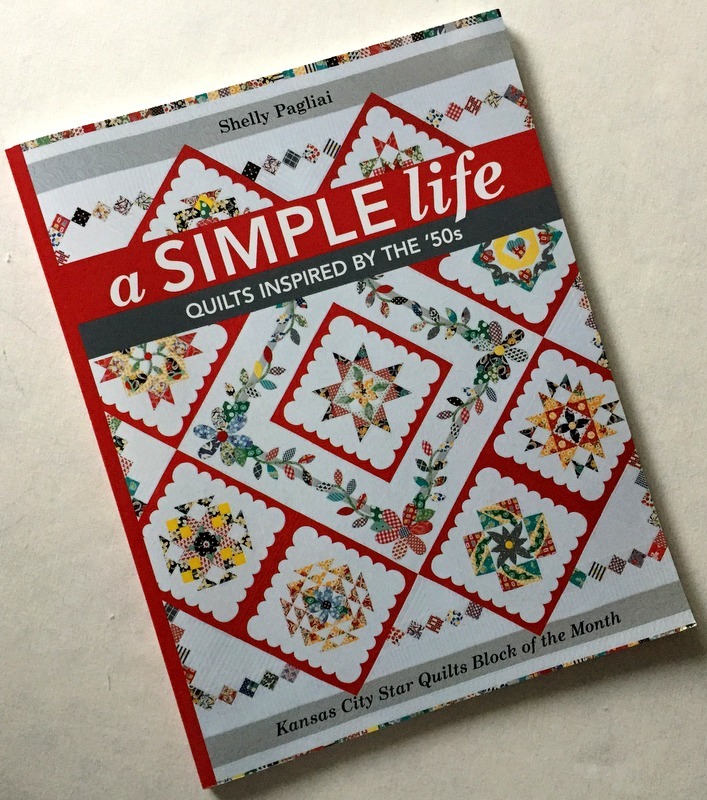 I have embarked on my second new project of the year, a sampler quilt called Hazel’s Diary Quilt from the book A Simple Life: Quilts Inspired by the ’50s by Shelly Pagliai of Prairie Moon Quilts. The book is a lovely tribute to Shelly’s mother, Hazel, who received a little red diary as a Christmas gift in 1950 when she was 14. Over the next few years Hazel faithfully recorded events in her life as a teenage girl growing up in rural Missouri. Her last entry was written the night before her wedding in October 1954. The book includes excerpts from Hazel’s diary with commentary by Shelly that puts the entries into historical context. Included in the book are directions for seven quilts, a quilted tablecloth, and an embroidered dresser scarf. I’ve chosen to make the medallion quilt you see on the cover of the book. It’s a daunting project because it involves a lot of appliqué. Since one of my goals in life is to work on my needleturn appliqué skills, this project seems made to order. Am I up for the challenge? We shall see! While the original Hazel’s Diary Quilt was made with vintage fabrics that evoke the 1950s, I am building my quilt around a new line called “This and That” by Jill Finley of Jillily Studio. In general I’ll be following Shelly’s color scheme of primary colors on a white background with black accents. This is Shelly’s quilt, which I was thrilled to see in person at the spring 2017 quilt show in Paducah, Kentucky put on by the American Quilter’s Society. You can see that the quilt is made of nine blocks set on point. Each block is surrounded by a scalloped border, and the block in the middle of the quilt is part of a center medallion that includes appliquéd vines, flowers, and leaves. The quilt measures 95″ square. Not only did Shelly design and make the quilt, she also machine quilted it. I am in awe. The star design finishes at 12″ square but the block actually finishes at 18″ square with the addition of the sashing strips and scalloped border. When a block is set on point, especially a star block, it changes the look. I decided I wanted my block on point to look like Shelly’s original block so I rotated the design 45 degrees before I made it. Shifting the orientation of the block also meant it needed to be sewn differently. Seeing the two versions side by side helped me determine the best way to construct my blocks and the proper size to cut the pieces. Since the center of my modified block is slightly smaller than the original, I knew I would also need to change the dimensions of the appliquéd wildflower in the center. A little quilt math revealed that my wildflower needed to be 92% of the original size. Here’s my Missouri Farm Girl block (without the appliqué) as constructed . . . I must confess that tiny black star in the center has not yet been appliquéd. I need a lot more practice before I tackle something that small and intricate. I did appliqué the petals and leaves using the needleturn method. Not perfect by any means but I think my skills will improve as my quilt progresses. That’s why I’m also going to wait to appliqué the scalloped borders on all the pieced blocks as well as Block 2, the appliquéd blossoms and leaves in the center medallion. Instead I will move on to Block 3, a charming design called Canasta based on the traditional Card Trick block. Oh Nubs, you are off to a spectacular start!! Your choice of fabrics is spot on and careful planning will yield a true treasure. I can’t wait to see the finished product, but the anticipation will be oh so sweet!! Dawn, I really appreciate how you walked us through your process. It gives me the confidence to attempt making changes to patterns to achieve a different perspective or to fit into a space of a different size. Also, your appliqué is lovely! Very complicated but you are more than equal to the challenge.